The Mark 83 is part of the Mark 80 series of low-drag general-purpose bombs in United States service. 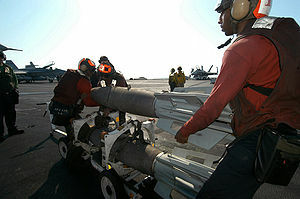 Ten Mark 83 bombs aboard a US Navy F/A-18E. The nominal weight of the bomb is 1,000 lb (454 kg), although its actual weight varies between 985 lb (447 kg) and 1,030 lb (468 kg), depending on fuze options, and fin configuration. The Mk 83 is a streamlined steel casing containing 445 lb (202 kg) of tritonal high explosive. When filled with PBXN-109 thermally insensitive explosive, the bomb is designated BLU-110. The Mk 83/BLU-110 is used as the warhead for a variety of precision-guided weapons, including the GBU-16 Paveway laser-guided bombs, the GBU-32 JDAM and Quickstrike sea mines. This bomb is most typically used by the United States Navy but is used by the USAF in the F-22A in a JDAM configuration. According to a test report conducted by the United States Navy's Weapon System Explosives Safety Review Board (WSESRB) established in the wake of the 1967 USS Forrestal fire, the cooking-off time for a Mk 83 is approximately 8 minutes 40 seconds. The bomb has been controversially used during the Saudi Arabian-led intervention in Yemen. ^ "FMU-152/B ELECTRONIC BOMB FUZE". Integrated Publishing. Retrieved 13 October 2010. ^ "Mk83 General Purpose Bomb". Federation of American Scientists. 23 April 2000. Retrieved 13 October 2010. ^ "Saudi airstrikes in Yemen violate laws of war, rights group says". Mcclatchydc.com. Retrieved 28 August 2018. This page was last edited on 12 February 2019, at 08:26 (UTC).